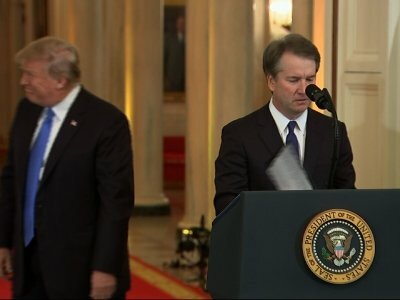 WASHINGTON (AP) — Conservative Supreme Court nominee Brett Kavanaugh plunged into his confirmation battle Tuesday, meeting face-to-face with Senate leaders in what promises to be an intense debate over abortion rights, presidential power and other legal disputes that could reshape the court and roil this fall’s elections. The confirmation marathon is expected to drag on for months, and no date has yet been set for hearings. GOP leaders, with a slim majority in the Senate, are anxious to have Kavanaugh in place for the start of the court’s session in October — and before the November congressional elections. Senators will be seeking access to Kavanaugh’s writings and correspondence, reams of documents that will take weeks to compile and even longer to review, giving opponents ample opportunity to wage a political battle. Protesters have filled the steps of the Supreme Court in recent days.